Boris Johnson was returned as Mayor of London on 3 May with a 3% lead over his nearest challenger, Ken Livingstone. Two prominent Conservative Assembly Members and allies of Johnson lost their seats: Brian Coleman, who represented Barnet and Camden, and had been Chair of the London Fire and Emergency Planning Authority, and Richard Barnes, who represented Ealing and Hillingdon, and had been Deputy Mayor. Cyclists will be pleased at the removal of Coleman, who was famously anti-cycling. (Unfortunately for cyclists in Barnet, he remains Barnet Council's Cabinet Member for Environment.) Things did not go so badly for Conservatives in the assembly election as it had been thought they might, and, with nine Conservative seats on the Assembly, more than one third the total, Boris Johnson should still get his budgets through for the next four years (and the activities in the Assembly will be essentially irrelevant). I'm therefore not expecting any major changes in roads policy in London over the next four years. The first test of intention will be the outcome of the reviews of "50 key junctions" on the existing Cycle Superhighways and "150 major junctions" on the other roads controlled by Transport for London. The kind of changes to the roads that these reviews come up with, or do not come up with, will show whether there is anything at all in Johnson's endorsement of LCC's Go Dutch campaign. The timetable for the reviews remains worryingly unclear, and "any junction improvements will be delivered after the 2012 Games". The exception is Bow roundabout (where two cyclists died on Superhighway 3 within weeks of one another last year), where unknown (to me) "improvements" will be carried out before the Games. So the first indication of the character of Johnson's new-found Dutchness will be seen at Bow. Indications are it won't be "Dutch" at all. But here's something that amused me, because like the best satires, it is about 70% true: a cartoon drawn by Bianca Ansems, a Dutch artist who is living in England, but who dares not cycle here. She's tried but she says she's been honked at and hit by cars despite following all the rules – well, welcome to the club. She captioned this picture In England, cycling is not leisure...IT IS WAR!! 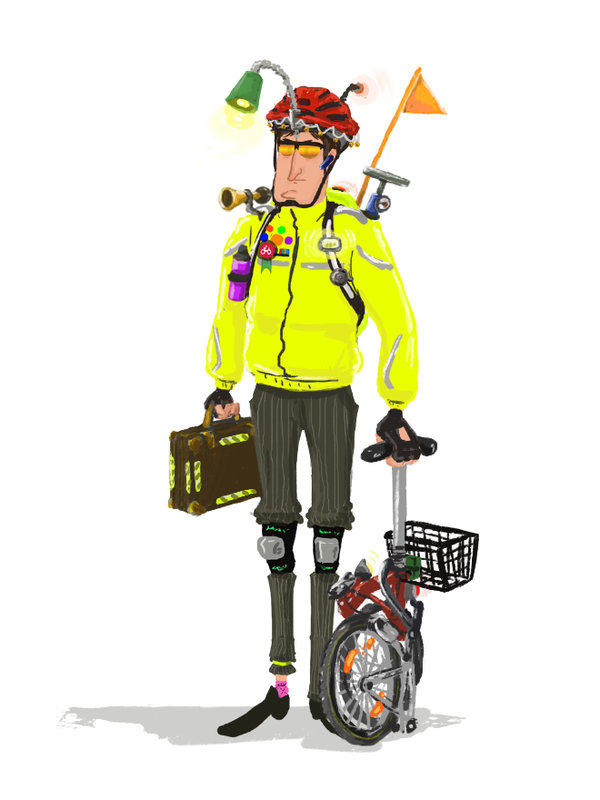 Yes folks, this is how the typical British cyclist looks to a Dutch person. And it's pretty accurate, down to the little details: note even the almost-LCC cycle campaigner's badge. And I don't blame British cyclists one bit for looking like this. They look different to Dutch cyclists because the conditions they experience are totally different. The gear is a rational and correct response to the environment. You need the folding bike because space for full-sized bikes is so short on our trains, and non-existent on other public transport, and there is so little secure parking, and so much theft. You need the maintenance equipment because friendly bike stores that will fix you up in a trice if you have a puncture or other fault are fairly few and far between, and our roads and cycle paths are strewn with glass and full of holes, thus giving bikes a hard time. You need the noise-making gadgets to counter the army of the "cyclists are the silent foe" pedestrain brigade, who don't bother looking left and right when crossing the road if they cannot hear a motor. You need to be brightly visible to the ridiculous "Nth degree", because the Highway Code suggests this, and if you are unfortunate enough to be knocked down and injured, you need to minimise your chances of being told by a stupid old judge that "you had only yourself to blame for not being conspicuous enough" and that therefore you deserve to have your injury compensation sum decimated. A similar argument goes for the helmet. You join a campaiging organisation and wear its badge because conditions are so atrocious, but you can see how they could so easily be much better with slightly different public policy, so you want to spread that message. The knee pads are going a bit far: I don't see many London cyclists wearing these, but then satire has to be about 30% untrue to be funny. So it is important to understand that the way our cyclists look, and behave, is a consequence of, and a reaction to, the conditions in which they find themselves, not a contributory cause of those conditions. There is a blogger known as Amcambike*, who lives in the Netherlands, and writes about cycling. He does not let his true identity be directly known, but I believe him to be a British or Irish expatriate, as his written English is perfect, showing no trace of foreign inflexion. I believe him to be the same person as "Paul", to whom I referred in this post last July. There is correspondence from "Paul" there, whose nonsense I grew tired of trying to contradict, and thereafter I have not published his comments on my blog (one of only two people I have taken that decision over). "Paul", or "Amcambike", appears to be actually one Paul Treanor, whose politico-philosophical writings are to be found here, because Paul Treanor's suggested cycle routes in the Amsterdam area are the same as Amcambike's. You venture into Treanor's politico-philosophical writings at your own peril (amongst other crazy things, he argues that sustainability is wrong, and art should be destroyed). In his Amcambike blog, his mission is to convince us that there is no point in us in the UK, or other countries, trying to emulate Dutch cycling policies, because he believes they will not work, and he believes they have not worked in the Netherlands either. He often quotes my writings (in order to contradict them), and his posts have in the past gained approving comment from a prominent member of London Cycling Campaign, who opposed the adoption of Going Dutch. He tends not to publish comments from those who disagree with him, but Cyclefisk has rebutted him on a couple of occasions. Even allowing for the fact that it was a demonstration, and that some people got dressed up for the occasion, cycling clearly means something different in London. It is treated as an urban sport or fitness activity, rather than a means of transport. That is ironic, because the Big Ride was intended to promote Dutch-style cycling policies. Of course this is the most total rubbish. Most of the cyclists on the Big Ride were not "dressed up for the occasion", they were dressed in rainwear, because it was raining. Most of the rainwear sold to cyclists in the UK is yellow or orange. That's a choice of the manufacturers and a consequence of the culture described above: it is reflected in the Highway Code, a government document having the force of law, which strongly encourages cyclists (and pedestrians, horses and dogs) to be dressed like this: part of the perverse culture of so-called "road safety" as opposed to "road danger reduction". It has little or nothing to do with how cyclists want to look and seem. So nothing on The Big Ride was showing that "cycling clearly means something different in London [compared to Amsterdam]". It doesn't mean something different. What does cycling "mean" anyway? For someone who writes on political philosophy, Treanor makes a remarkable number of category mistakes or semantic errors. It is hard to imagine a demonstration of this kind in Amsterdam. It is also hard to understand the relevance of Dutch cycle infrastructure for the type of cycling which appears to be common in London. It is even harder to imagine a demonstration by thousands of cyclists in Amsterdam calling for "Cycling to be made as nasty and dangerous as it is in London". But in the parallel universe of Amcambike, perhaps even this is not too strange a possibility to contemplate. *Update: following publication of this post, on 9 May 2012, the Amcambike blog was deleted by its author. "commented how amusing it was that Amcambike, in attacking the totality of London cyclists, was attacking even the cyclists who look to him for confirmation of their views, the anti-Dutch-infrastructure brigade." more "especially" than "even". None of the Ambassadors were hi-viz and helmeted, after all. The argument against hi-viz and helmets and for sensible bikes is one that many Assembly members have made, and one that tends to be dismissed by the road warriors on racing bikes who had embraced Paul as evidence of Dutch infrastructure dissent. I don't think Paul can be British, given how little he understands the situation here. Can't access Amcambike - the blog seems to have been made private. It appears that "Paul" or whoever he/she is has deleted the Amcambike blog. Alas. The most interesting Amcambike argument to my mind was that The Netherlands was an example of a country with poor cycling conditions. I never managed to get him to explain why he thought this. Assume you have seen the news in the Barnet Times that Councillor Coleman has been demoted and is not longer in the Cabinet or running evironment. Oh the irony... A year later and it turns out Bianca Ansems directed that City of London film with the eggs. Maybe that was satire, too?